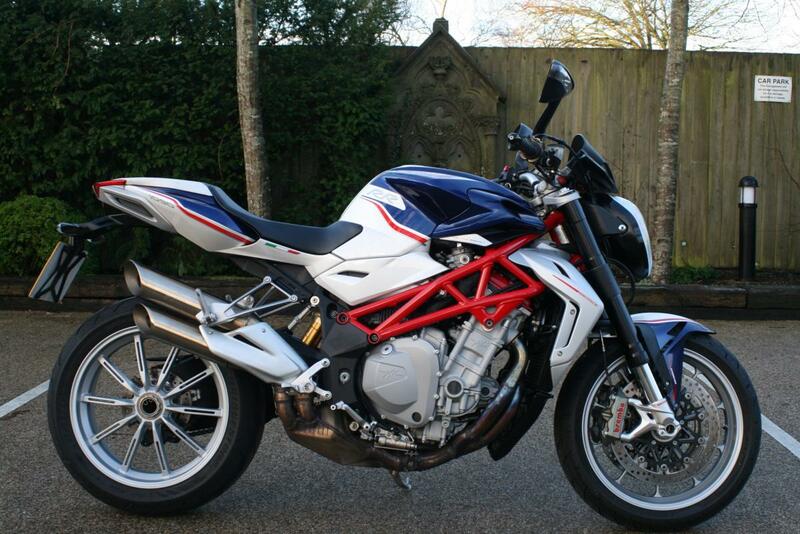 We are thrilled to be able to offer you this superb MV AGUSTA BRUTALE 1090RR SPECIAL EDITION. Based upon the America colours, this very limited number Brutale is different to the standard RR., There aren’t a lot of ambiguities with the “RR.” The bike is open, honest, and can be taken at face value. In short, it absolutely screams Italian muscle bike, and is by no means an exercise in understatement. The fuel tank, seat and subframe look fairly complete and typical of other contemporary sportbikes, but just lower your gaze a bit and the nakedness becomes readily apparent. First you will notice the exposed Trellis frame that MV Agusta painted bright red. After all, one should never be too subtle for one’s audience. That one detail sets the tone for the rest of the bike. Stripped down to the bare essentials, the 1090 RR leaves nothing to the imagination, so what you see is what you get, and you can see everything. All this leaves the bike looking mean, clean and ready for serious business with a post-modern, Mad Max vibe. Low Rate finance is available on this bike, credit subject to acceptance. For a no obligation quote, please call 01747 811196 and select option 1 for sales. Thanks for looking! !